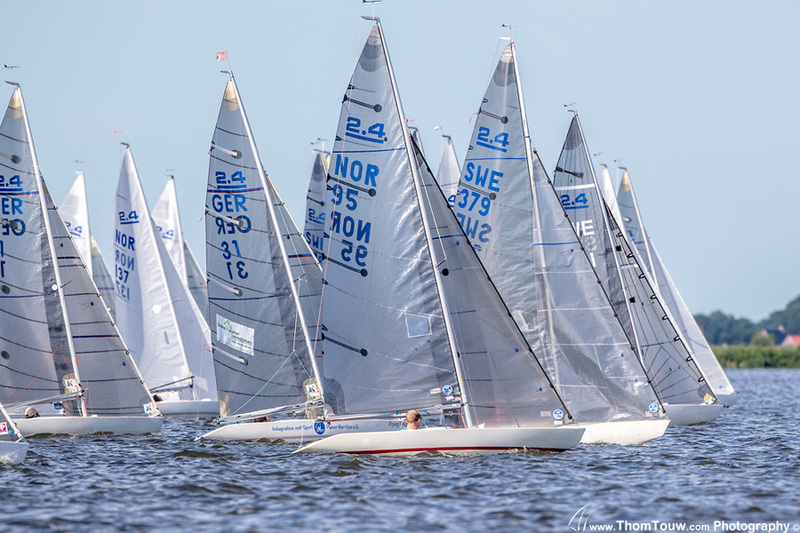 Eighty-four boats representing 14 different nations headed to Sneekemeer, Holland for the 2.4mR Worlds, hosted by Koninklijke Watersportvereniging. The first five days of racing brought the sailors an average of 19 knots gusting up to 24 knots of wind which is towards the upper limit of racing conditions in the class. Despite the strong winds, the race committee got in 3 races for all 4 flights. The fleet was split in 2 starts with 42 boats in each, a total of 84 boats. The first 6 races were qualifiers where the best sailors were split in different fleets. The following days would bring light air conditions which made it shifty and tricky for sailors when it came down to making tactical decisions. Unfortunately, due to the lack of wind on the last day, the race committee was unable to achieve any additional races, as conditions were not sailable. Despite the conditions, ten great races were completed in the series allowing for two discards in the scoreboard. North Sails clients placed within the top 10 finishers. There was a variety of North sails products being used amongst the top of the fleet. Stellan Berlin, SWE 379, who took the World Championship title with 5 bullets in the gold fleet, while using the sails designed for the Charger Mast, the FL-4, FH-2, CA-T75, TB-5, and HB-4. This was his tenth gold title within the fleet using North Sails winning sail design. Immonen, FIN 166; Cichocki, POL 7; and Kokkala, FIN 190 who finished 7th, 8th, and 9th respectively, were also using partial North Charger designs. Pascoe, GBR 141, who finished in 4th place used the North Sails Superspar Design.